Filed to: cheer up!Filed to: cheer up! Everyone loves a good timelapse, but they don't always go as planned. 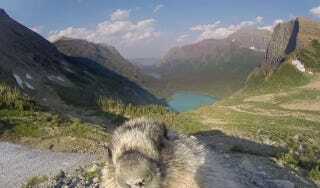 While a Go-Pro camera was collecting footage for an environmental action video, a marmot popped up to investigate. Soon, majestic mountains, serene lakes, and fluttering clouds all made way a snuffling nose and lens-licking tongue. The national park system is fantastic, and worthy of active visiting and protection, but it's hard to say the shot for this protect-the-parks campaign was spoiled by the introduction of a photobombing marmot. Sure, it might not be as effective as an awe-inspiring bit of visual filler, but instead it's an instantaneous draw into the very real world of the creatures who live in this stunning landscapes! You wouldn't let this adorable fuzzball be driven out of his or her cozy home, would you? Alas, they elected to go with the un-marmotted segment of the timelapse, leaving the latest wildlife selfie in the editing room. I admit it: my love of exposed strata in the Rockies and the visual balance of talus cones resting at their angle of repose is quickly overridden by total delight at a small sniffing nose investigating the Go-Pro camera. Rock on, (not-so-)tiny marmot, and may you find something more nutritionally valuable than plastic and glass to munch on soon. As far as technical aspects, was pretty easy as far as timelapses go. I set up the GoPro Hero 3+ on 2K video resolution filming at 24 frames per second. (You can use any video setting on the GoPro to achieve this effect, I chose 2K because it allows room to crop without loosing quality). Then I imported the footage into Final Cut Pro X. I sped up the 25 minutes of clouds moving down to 2 seconds. Then when the marmot came in, I just let the video play at normal speed. If you haven't gotten enough awesome animal footage, when you strap a Go-Pro on a polar bear, things get very interesting, very quickly.